This workshop is ideal for beginners who are interested in learning how to make real silver jewellery with this amazing creative clay. 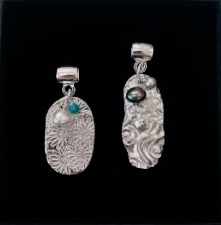 The class will cover how to plan, create, fire and finish simple jewellery designs in real fine silver. With all use of equipment and materials (including the silver!) included in the price! Expect to make a pendant – which will be ready to wear by the end of the class. We’ll cover all the key techniques of planning, rolling, shaping, design and decoration as well as polishing and making up your finished pieces. We’ll also look at how easy it is to fire the clay at home – you don’t need a kiln. I will talk you through every stage, step by step with lots of demos and tips for silver success! 4. How to fire the clay at home. It takes just a few minutes and you don’t need a kiln. 6. The next steps to continue your silver clay adventure…. !